It’s the time of year when high school seniors are thinking about the next great step in their lives—college. They are thinking about where to go, where to live, and what classes to take. College is a wonderful experience but it can get expensive in a hurry. Application fees, tuition, student fees, housing, books… the list goes on and on. We are committed to helping the students in our service areas achieve their goal of a college education. 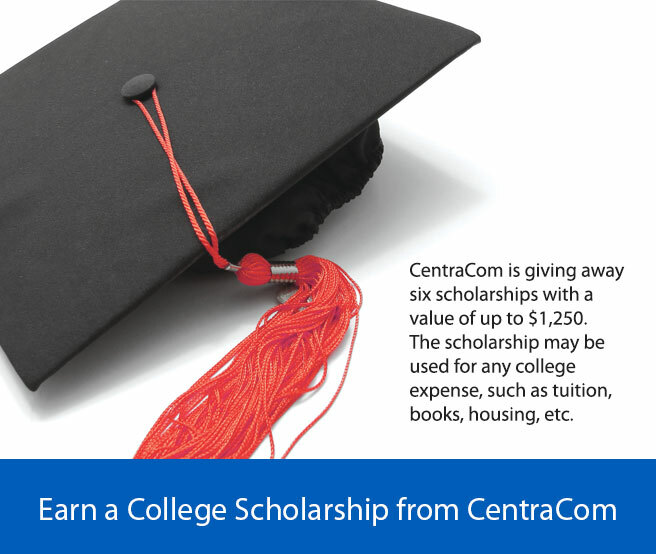 For the past thirteen years, CentraCom Interactive has offered scholarships to eligible high school seniors planning to attend college. This has been a great opportunity not only to serve our community, but to get to know future leaders of America. We are pleased to announce that we have again partnered with Snow College to bring even larger scholarship value. We will be giving away six scholarships with an initial value of $500. If the recipient chooses to attend Snow College, the scholarship from CentraCom will be $1000 and Snow College will match $250 raising the value to $1250. The scholarship may be used for any college expense, such as tuition, books, housing, etc. If you would like to apply for a scholarship, please visit www.centracom.com/scholarship for more information and to download the application. Or contact Erin Williams at (435) 427-0688 or (800) 427-8449 to obtain an application. But hurry! The application deadline is April 7, 2017.